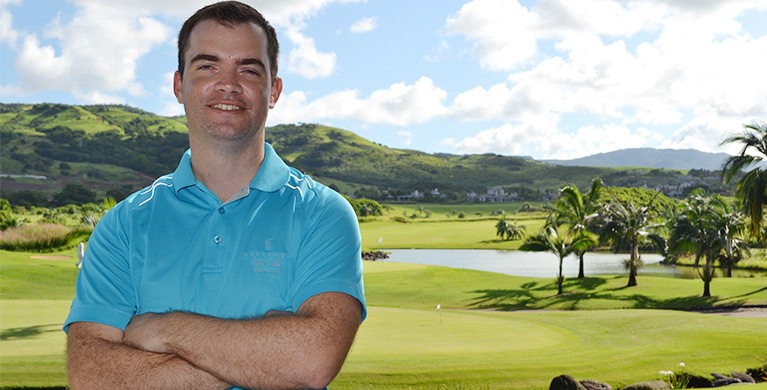 Back from a business trip to Thailand, Jonathan Menteath, General Manager of Heritage Golf Club (HGC), talks to us about Mauritius, his new duties, and his vision for the club. Let us introduce him to you. 1. You arrived in Mauritius about 6 months ago, is it your first time on the island? What do you particularly like here that made you move from South Africa? It’s not my first time here. My first trip to Mauritius was actually to Heritage Le Telfair Golf & Spa Resort in 2008 where I was privileged enough to spend a week coaching at Heritage Golf Club. Since then I have travelled to Mauritius another 5 times including a trip for my honeymoon and then to host golf groups. I enjoy the clean environment, the safety of Mauritius and of course its beautiful surroundings and scenery. The people are also very friendly and helpful. 2. HGC was awarded Indian Ocean’s Best Golf Course for two years in a row at the World Golf Awards. What makes the Heritage Golf Club the best golf according to you? It has everything from two 5 star hotels and villas, to a supremely conditioned golf course as well as the best staff in the Mauritian golf industry. Peter Matkovich has also designed a gem of a course with every hole offering something different, it’s a true championship layout but also playable by golfers of all abilities. 3. What are the qualities/strengths that are required to manage a golf that has recently been added to the European Tour’s courses? You need a level head and the ability to absorb a lot of pressure, an eye for detail and a commitment to implement the highest standards…always. You need a good understanding of people, golf and food & beverage, along with a decent understanding of the agronomy side of maintaining a golf course. 4. What would you like to achieve as HGC General Manager? What is your vision for HGC? I would like it to remain as the number 1 golf course in the Indian Ocean, to be a place that creates memorable moments for all golfers and a club that contributes positively to the growth of golf in Mauritius. 5. The 17th hole has been listed amongst the 18th most challenging holes of the European Tour. Could you give us some tips about how to play on this hole? Often played into the wind a low tee shot favouring the left side is best. There is a big dip before the green flanking the right of the hole that needs to be avoided and very often you need to take as many as 3 extra clubs in order to reach the green; it is a deceptively long approach to the green. The green itself slopes from back to front so any ball hit beyond the pin leaves a challenging putt. I would take my par and run to the next tee every time on this hole. 6. The only Footgolf course in Mauritius can be found on Heritage Golf Club’s Short Course. Are people curious about this new activity? Yes Footgolf is becoming more and more popular, especially amongst the youth and those that enjoy both golf and football. We hope to host the first Mauritian Footgolf tournament in the near future. 7. How do kids react to the Junior Golf Academy that is in partnership with SNAG®? SNAG brings a fun element into golf for kids. Kids love having fun and that is what golf should be all about. The SNAG program allows for various skills to be learned whilst the kids play as they normally would. We get a lot of smiles and hopefully some future champions will emerge from this program. 8. Next year, the third edition of the AfrAsia Bank Mauritius Open will be held at Heritage Golf Club. After Anahita this year. Looking forward to this event? How do you intend to prepare to host this event in 2017? Yes we can’t wait to host Mauritius’s biggest sporting event, the AfrAsia Bank Mauritius Open. This event has changed the face of golf in Mauritius and we are immensely proud to be a part of it. We have a great team that plans and runs the event. Planning for the AfrAsia Bank Mauritius Open starts almost a year in advance and it does get easier each year as we have the opportunity to build on the successes of the previous years. With our experienced Heritage Events team I have no doubt that the 2017 event will be an even bigger success than the previous years. 9. Any event/news to share with us regarding HGC this year? We have become a very popular venue for corporate, professional and golf tour groups but perhaps our most noteworthy piece of news is that we were recently voted as one of the top 3 Golf Resorts in the Middle East and Africa by Golf Digest in 2016. 10. Since you have arrived at HGC what’s your best memory at Heritage Resorts? Experiencing the various facilities and activities around the resort from initially staying at Heritage Le Telfair Golf & Spa Resort and Heritage The Villas, to experiencing the Tepanyaki table at the Gin’ja restaurant have all been great but the best of all has been the warm welcome that I have received from all of the Heritage Resorts staff. Hard worker with a passion for leadership, business and assisting others to reach their true potential, Jonathan Menteath is Heritage Resorts’ new high profile figure.